CAC’s Rubén Alvarado writes from Peru and our work with UNICEF Peru. October 27th 2015. “No”. The word spoken with peaceful insistence, without the intention of pressuring or convincing. I take the risk, full of hope, and explain the meaning and the value of a “Yes” in the request that I’d just made. “No me gusta que me tomen fotos, me pongo brava” (I don’t like photos, I get angry). The answer followed by an implacable smile, implacable because of its honesty. And she walked away from me, and I walked away from her, joyfully resigned to my defeat, because she used her voice, did not impoverish herself in order to please someone, she let her freedom flourish. 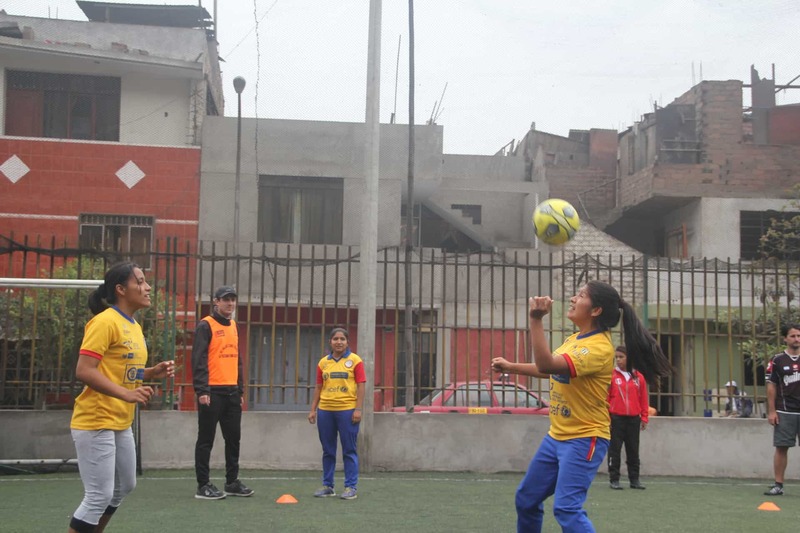 Esmeralda, 7 years old, lives with her family across the street from the pitch in “El Agustino”, in Lima, Perú, where we held our trainings during the first week there, with various diverse organizations that use sport as a tool for social development, with magnificent results. She would cross the street every day in order to beautify our learning space, but also to teach us powerful lessons. She surrendered to the game in the absence of answers, or when she did not not how to do what the game demanded, or even when she did not quite understand what happened at all. She rested, even if the group continued playing, if her body asked for rest. She played, even if the group rested, if her heart asked for play. Once, when the coaches discussed how to fix the world’s problems, she went ahead and made a colorful path made of cones, maybe to guide us in that venture. Another time she would pick up the cones that we would not use anymore, without us asking, and did it with such will that she even gathered the ones we would use in our next game! “Will we play more games today?” If she found a negative answer to this (daily) question, she would leave. Why would you stay in a place where all the fun has finished? Quick reminder, we in CAC do not coach children directly, we coach coaches who educate children, Esmeralda joined the training spontaneously, lucky for us. In our Messi for Conflict Resolution game, participants make 2 lines and everyone has a number. The coach calls out one or more numbers, and the people with the called numbers have to run around their lines and arrive to the same or a different place inside of them, depending on the instruction. During it, Esmeralda seemed alert, she observed her teammates, went over, both mentally and with her fingers, the mathematical movements needed to succeed. Nora called out her number and she ran around her line towards her new, but well studied, place in the line. She knew exactly what to do, I listened when she spoke to herself. Right before arriving, her teammates (adult coaches) started telling her what to do, where to stand and how to do it. You might ask “what is wrong with that?”. Nothing, at all. We practice Self Directed Learning, because we believe that it honors our capacity and freedom to decide, even in these seemingly irrelevant scenarios, like arriving to your new spot in the Messi for Conflict Resolution game. I told you this long story, not to make someone wrong, but so we could have a shared image from where I could offer you something that, in my perspective, functions as a core component in the creation of spaces for Self Directed Learning to emerge: Trust. We reflected on this issue with the group. Do we trust our kids enough to make their own choices? Do we think, maybe unconsciously, that we know better than them? How does this idea influence their learning? When does authority enhance growth and evolution? When does it not? How can we respect their freedom to decide at all times while coaching? And the reflection didn’t end, even when the trainings did. And we hope it doesn’t. People learn better when they make their own decisions, on how to best resolve their problems and also, how to best manifest their intentions. Creating safe, intentional, containers for this active and explicit decision making process to occur, achieves equal relevance to their learning as the content learned. “The medium is the message”. In this way, the structure enables participants to use their voice at all times, not only when playing games or when reflecting on something, but at all times and in different forms of expression. After our Child’s Rights session we ask the coaches to commit, through a promise, that they will always protect children from all the different types of violations that might affect them. This time we let the coaches write their own promise, so it felt closer to their hearts and minds. We gave them time and space for the magic to emerge. After some time we had 15 adults performing a short but potentially award winning play about violence and how to overcome it, that ended with them reading their promise out loud and our frenetic applause. We could have had told them what to do, but we didn’t, and that happened. Magnificent unexpected outcomes take place in safe, intentional Self Directed Learning environments, if we trust people and the process. The group concluded this deep and fruitful session with gratitude and eagerness to continue exploring these topics, methods and models of education, and of course, to start playing the games in their communities. It feels like this program also helped them come closer as a network of sports for social development. Esmeralda got an acknowledgment as an honorary participant of our program. She left to school that day with an even bigger smile and dirt on her face and knees, evidences of major success. Next: How Can An Empty Beer Glass Stimulate Self-Directed Learning?